Yellow flowers are eye-catching. The descriptions of a few that have been garnering attention this spring follow. Butterweed, also known as cressleaf groundsel, is additionally known as Senecio by many. The latin name was Senecio glabellus for many years but was changed in the last few years to Packera glabella. Other common names include ragwort and squawweed. Regardless of what you may call it, this is a weed we have been seeing much more frequently in recent years although it is native to North America. It tends to prefer cool, wet conditions and is common in fields and roadsides. It has been known to find its way into nearby landscape beds. Butterweed is a winter annual that grows erect on a hollow, succulent, smooth stem from a basal rosette. Stems are typically green but can have a reddish coloring as well, often in vertical stripes. Stems can reach 3 ft. in height. Leaves along the stem are deeply lobed, smooth, and often glossy. The flowers of this aster are somewhat distinct. 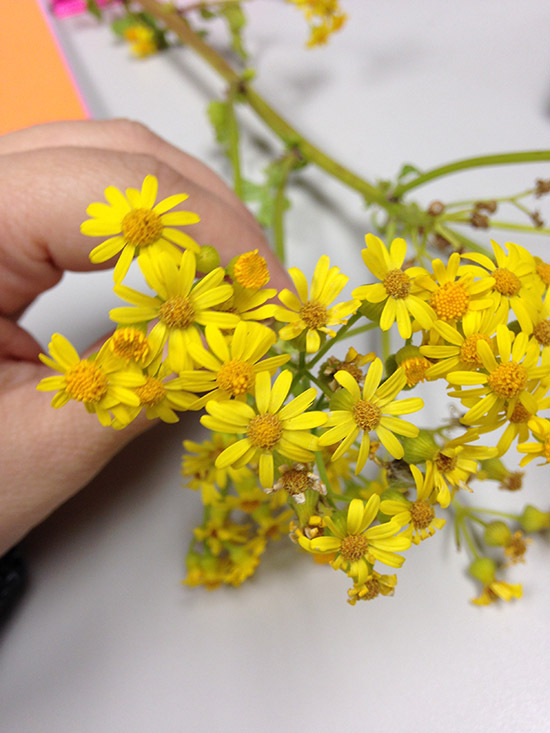 Appearing in clusters at the end of the stems, they are bright yellow or golden. Unopened flowers are somewhat rounded in shape. Slightly lighter colored outer ray petals number 5 to 15 and surround the slightly darker colored disk florets. The number of petals is useful in differentiating between this species and other yellow weeds in bloom at this time. The seed heads are dandelion-like puffballs which are disseminated by the wind. Fig buttercup (Ficaria verna or Ranunculus ficaria) or lesser celandine is a short, invasive perennial. Introduced as a garden ornamental, it is quickly becoming a serious invasive in Illinois. Mats of leaves can dominate forest floors blocking light to native plants. It is often seen in moist areas in lawns or adjacent wooded areas, near streams. 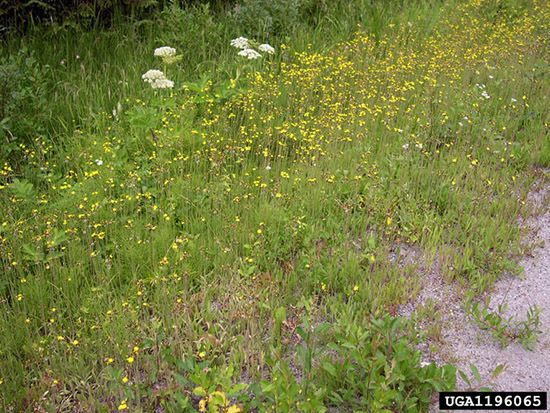 It grows in moist soil of floodplains and seepage areas. It has appeared in wooded wetlands, both in open sun and in shaded areas. The flowers are attractive, up to 3 inches wide, and aid greatly in identification. They are usually 8-petaled and on stalks. 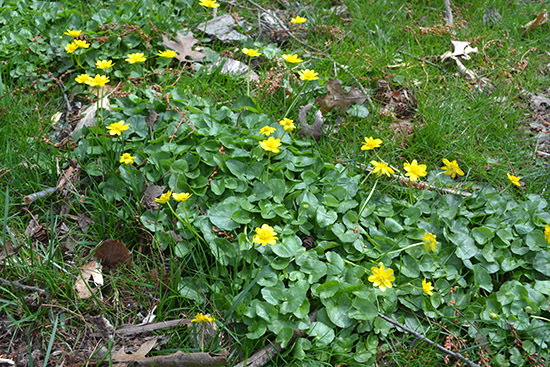 Lesser celandine flowers profusely and deer don't seem to like to eat the plants. From a distance, it could be mistaken for marsh marigold (Caltha palustris) however. The leaves can be irregular in shape but are generally heart-shaped or kidney-shaped. Size is variable but they are shiny, succulent, and often dark green. Once the flowers die back, bulblets (bulbils) are visible above the ground. It has small tubers that aid with spread and allow it to overwinter. Leaves and basal rosettes appear again in late winter. Yellow hawkweed or field hawkweed (Hieracium caespitosum) is a creeping perennial that forms patches via both stolons and rhizomes. The leaves are densely hairy and form rosettes. Similar to dandelion, the stems exude a white, milky sap when crushed and the flowers are bright yellow ray flowers. Yellow hawkweed flowers however are smaller and are produced in clusters of 2 or more at the top of 10-20 inch stalks. Unopened flower buds are covered with rows of black hairs.